Wow, don't think I've played so many games in one week, been very fortunate this last week. Up in Suffolk the children and I played Cuatro, Battle Line, Hanabi and The City multiple times. Then Wednesday night - board games at the London Apprentice with the IBG (Isleworth Board Gamers) - it was another Hanabi and Railways of North America. Yesterday, Tom and Ivy (age 19 months) popped over and we played The City again with Basti, plus Babel which I liked a lot, another Uwe Rosenberg game. Today Tom and Ivy picked me up and we went over to Andy's in Whitton for the afternoon and more new games to me anyway! Splendor I've ordered and playing it I'm glad I have, another game I enjoyed (must check to see if there are many I don't: hold on, Galaxy Trucker, Steam Planet to name but a couple! ), followed by the prototype I've been sent by Grublin Games, and then Legendary, Marvel Heroes deck builder. Railways of North America is an interesting expansion to the Railways Tycoon / Railways of the World series. After the original board, Eastern US, and the expansion, Western US, the North America was never going to be anything but Canada but I guess the US company couldn't lower themselves to calling it such in case their main buying audience in the USA were put off. Anyway, the Canada map is wide, and thin. It looked too small to play well with four but with four of us keen to try it we were able to disprove this. The box says it plays up to five, I think that would be very cramped but you never know. There are some pretty good unique features; the snow line, which adds to the cost of building per hex; the mines, which add additional cubes - 1 to 5 depending on your luck - to grey cities; and the ferry cards allowing you to connect to some offshore cities. We enjoyed it. We thought it was going to be expensive but in the end not that many loans were taken. The major routes didn't bring in many points and the proliferation of grey cities was interesting. This expansion also comes with cards and rules to combine West and East US maps, bring it on. So, let me tell you all about the 'prototype game'. 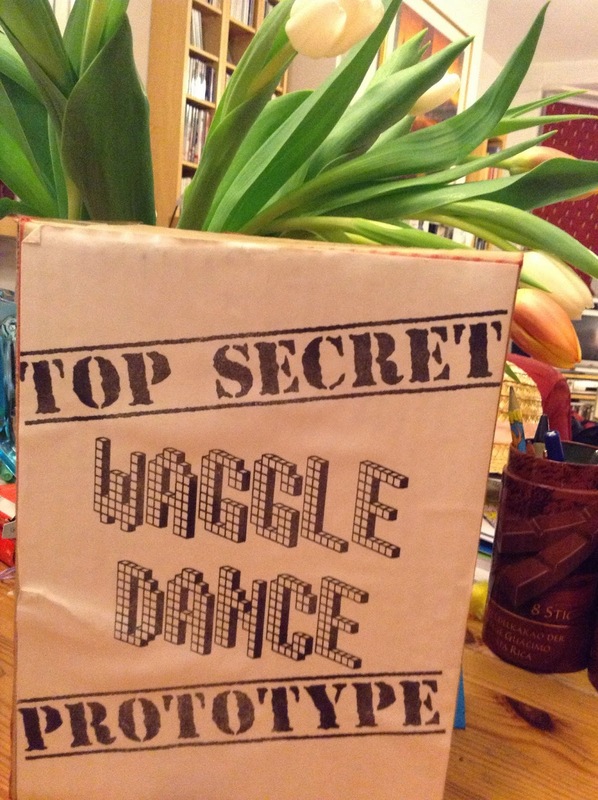 It's called 'Waggle Dance', great name. It's by a designer called Mike Nudd and Henry of Grublin told me it was his immediate choice for the publishing company's second game. It's bee themed, which I like. It contains 18 dice per player, which I'm often dubious about. Tom and I set it up yesterday but then missed the rules for the 'Queen Cards' so gave up at that point. I found them, on the back of the rules sheet, so played a four player couple of rounds early today and then at Andy's we played a full game. Henry had told me that they were happy with game play and I have to say that everything worked well for us. It was tight on the scoring, and there are certainly a lot of decisions to make. The use of the dice is perfect for me. 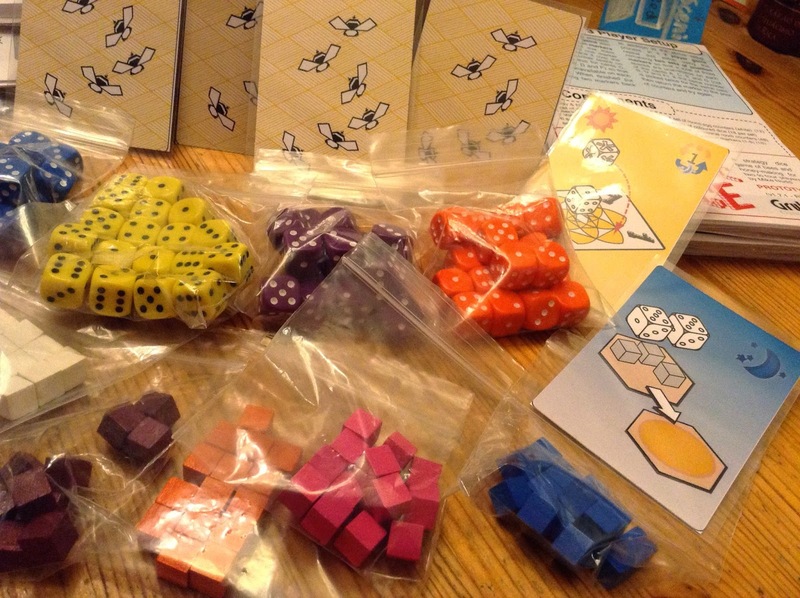 Plenty of choice as to which action you decide to allocate your dice too - like Castles of Burgundy for me - and the chance to tweak them with cards as well: excellent. Henry's questionnaire had us looking at the icons and rules. Both aren't far off but do need some improvements, which is what sending prototypes is all about. Am planning to play with the family over the weekend, will be interesting to see what Basti and Josie make of it. I've certainly bought into it. Andy earlier suggested that it offered nothing 'new', and I suppose he has a point. But then if you expect every new game to have new mechanics you're going to be disappointed. If I was looking for every new novel I read to offer something new... you get the point. For me, the mechanics and the play was great. There are a vast number of big decisions to make, several options to consider and most importantly you need to get your timing as efficient as possible. Indeed, it was heavier than I thought it would be, which is good. The rules are pretty straight forward after one game, I doubt you'd need to refer to much for following games. I'm excited by it. Keen to try it some more. Always good signs.